34 to 41.99 square inch custom die cut magnets - outdoor & car magnets 30 MIL will allow you to drive your campaign around the town. These custom printed magnets are made to meet rigorous expectations of outdoor campaign. Your potential customers will read information over these die cut magnets when your car is parked at the parking lot or crowded streets. Our prices include full color printing and typesetting assistance. All our promotional magnets are made in the USA and guaranteed to arrive on time! 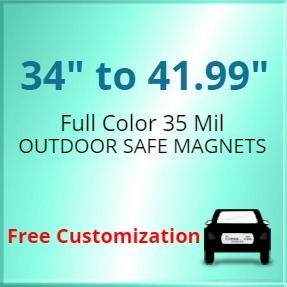 Request a quote to know what you can save on ordering 34 to 41.99 square inch personalized die cut magnets - outdoor & car magnets 30 MIL in bulk. Product Weight: 10 lbs per 75-approx.